I’m a California native, born and raised in South Los Angeles. I’m also a first-generation college student at California State University, Los Angeles where I’m pursuing a bachelor’s degree in Public Health. Outside of school, I volunteer at my daughter’s local elementary school helping fundraise for educational programs for children. I also spend time working to help bring attention to the needs of other “non-traditional” students and student parents like myself. My personal experience returning to school has sparked and guided my passion for advocating for the student-parent. After high school, I made an initial attempt to attend community college but ended up dropping out and entering the workforce instead to contribute income to my household. Years later, after becoming a wife and mother, I was forced to look at my life differently. I could no longer stay at a job I had plateaued in so I realized I needed to return to school and complete my higher education. Immediately upon returning to school, I noticed a gap in the transition process for non-traditional students going back to school. Non-traditional students don’t have a foundation or support that effectively helps them navigate the college experience. On top of my academic workload as a student parent and personal responsibilities, I had to advocate for myself to find programs that would ensure I had access to financial literacy and child care assistance. These programs were not immediately made available to me but rather I had to find myself. These under-promoted and under-funded programs are absolutely essential for student parents and non-traditional students like me to achieve academic success. That’s why I’m deeply committed to advocating for these supportive programs to make sure non-traditional students get the support they need from any campus they enter. Morchea Canonge is a California native and first-generation college student at California State University Los Angeles. 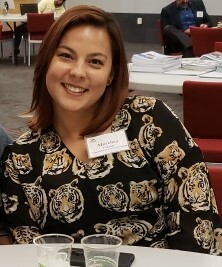 Morchea is very active in her community by volunteering at her daughter’s elementary school and advocating for the needs of non-traditional students. She’s shared her experience as a non-traditional student and student parent at various conferences including at last year’s Education Writers Association annual conference and participated in Young Invincibles’ Young Advocates program.